Orlando Magic shooting guard Arron Afflalo celebrates in the first quarter against the Atlanta Hawks at Amway Center in late December. 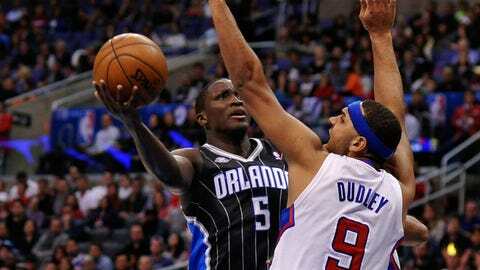 FOXSportsFlorida.com checks in with color analyst Jeff Turner (@JTurnerMagic) to get the latest on the Magic. FOX SPORTS FLORIDA: With the halfway point in the 82-game season fast approaching, how do you assess the Magic as a whole? JEFF TURNER: December has been tough, simply because we had so many road games (to begin the month). We’ve seen some good things. The one thing I would say about this team — from an identity standpoint — is that they compete for the most part every night. The young guys are trying to learn, and they’re playing hard. We’ve had a few games where it kind of got away from us. But if you’re a young coach like Jacque Vaughn, and you’ve got a young team, the biggest thing is you’ve got to have them coming out and competing every night. If I were an opposing coach, that’s what I would be telling my team: Don’t look at their record. Know that this is a young team that’s going to come out and they’re going to play all 48 minutes. They’re going to compete no matter who’s in there. So that’s a good thing. 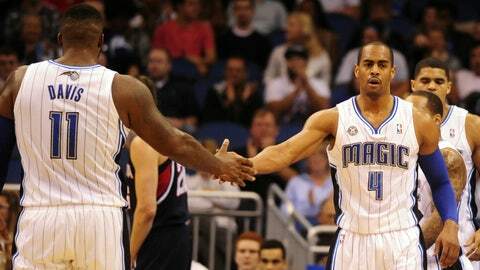 FSFla: Arron Afflalo scored only 16 points against Miami, 15 points against Golden State and 12 against Cleveland. What are opposing teams starting to do to limit his effectiveness? JT: I thought Golden State and Cleveland did a great job of sending an extra big at him, whether he caught it on the low post, which he likes, just trying to take it out of his hands. Anytime he was involved in pick-and-roll situations with Glen Davis, they really showed hard on him. I think we’re going to see a pretty healthy dose of it since both teams had success against him. FSFla: So how does Afflalo handle those situations? JT: He’s got to be patient and just take what the defense gives him. If you’ve got somebody running at you, that means somebody else is open. He’s got to be able to find that. And the second part of that is, whoever else is open has to become a factor. And that will open Arron back up. FSFla: The Magic have a 2-8 record when the margin of victory is five points or fewer. How does that jibe with a roster that includes lots of young players but also veterans such as Afflalo and Jameer Nelson? JT: Yes, you do have some veteran players in Arron and Jameer, even Glen. But you’ve still got some young players with them. And they’re going to make mistakes. That’s the good thing about basketball. You’ve got five guys, and if one guy makes a defensive breakdown, doesn’t get the ball inbounds or something like that, it breaks a lot of stuff down. Even with those two or three guys, it’s still a very young basketball team. So closing games at the end is going to be a challenge. FSFla: What has been the most pleasant surprise thus far? JT: Obviously the play of Arron Afflalo has been a big surprise. I’m not sure why it should be. His history through his seven years is he gets better every year, but you wonder what the ceiling is. To be honest with you, I thought Jameer’s health has been good for the most part and what he’s done. And I think (Victor) Oladipo has been fun to watch, his progression and learning. He’s been handling the point better than I thought he would. FSFla: Who has been the best guest analyst with you and David Steele so far this season? JT: Best guest analyst? That’s a tough one. They’ve all been good. Obviously Dennis Scott has an advantage since he does this for a living (on NBA TV). I thought T-Mac (Tracy McGrady) was good. Pat Garrity was good. I guess the most fun, from a storytelling part and everything, was Pat Williams. That was a treat with him sitting here. FSFla: Any chance when you go to Sacramento that the new minority owner of the Kings (Shaquille O’Neal) gets some air time? JT: I don’t know. That’s a good question. We’ll have to see if we can work something out. I forgot about that one. I’ll put my people on that.